Whether your estate planning needs are simple or sophisticated, we treat them with the same level of care and efficiency. We can help you establish your first plan – or update an existing one, address significant life events (including marriage, children and serious medical issues), and work with you through complicated family dynamics. Our lawyers develop and implement integrated income, gift, and estate tax planning strategies designed to meet your goals. We work closely with you and your other professional advisors (including accountants, bankers, and financial planners) to deliver high-value legal services as part of an integrated estate and business succession planning process. We advise you regarding tax-advantaged solutions designed to preserve your wealth – enabling you to sustain your desired lifestyle, protect your business, establish a charitable legacy, and gift to your children. We advise personal representatives, trustees, and beneficiaries concerning the administration of estates (probate) and trusts. We help clients make informed decisions concerning post-death tax planning opportunities, payment of estate/trust expenses, maintenance and distribution of the assets in accordance with fiduciary obligations, tax reporting obligations, and closing of the estate/trust. We take a proactive approach, focusing on quality administration, detailing potential issues, and guiding forward-thinking decisions. Unfortunately, disputes can arise. Where possible, we seek resolution through negotiation and/or mediation. If litigation or arbitration is necessary, we represent our clients in court to achieve the best possible results – seeking to preserve the value of the estate. A husband and wife requested our assistance in structuring their estate plan. Based on reports they had heard in the news, they mistakenly assumed their estates would not be subject to any estate taxes. After reviewing their assets, we discovered that without any tax planning their estate would owe more than $430,000 of estate taxes on the surviving spouse's death. We worked with the clients to establish a joint revocable trust with tax planning provisions. 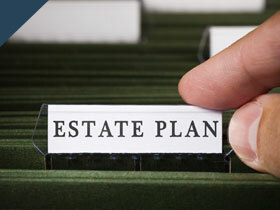 As their estate plan is now structured, with current estate size and tax laws, there will be no estate tax due on the first spouse's death – and little, if any, estate tax due on the death of the second spouse. We often work with young families. In one case, we helped a husband and wife who have three young children and no living relatives. Naturally, they were concerned about who would take care of their children if something unfortunate were to happen to them. We helped our clients understand the issues involved and worked with them to draft wills allowing them to nominate individuals to serve as guardians for their children. The wills also contain trusts for the children to assist the guardian in supporting them and providing for their education. When an elderly widow was no longer able to handle her affairs, we were asked to assist. We were originally contacted by our client's son who, due to his own disability, could not adequately assist his mother in caring for her affairs. We located a professional fiduciary and prepared the necessary pleadings and documents to have the fiduciary named as trustee and conservator. Shortly after our representation began, our client suffered a serious head injury. We reacted immediately to arrange for an emergency temporary guardian so health care decisions could be made and our client could receive the treatment necessary for recovery. A client and her sister were appointed as co-personal representatives of their father's estate. Because our client lives in California, the sister was responsible for administering the assets located in the Pacific Northwest. When the sister failed to fulfill her duties, we intervened and pursued our client's interests in court. We obtained orders that appointed a new personal representative, awarded our client her requested personal representative's fee, and required the sister to pay a substantial portion of our client's attorney fees. We also obtained orders that were necessary to move the estate toward final distribution and closing. We assisted a client with the formation of a trust to avoid probate and help her plan for any future incapacity. In the event she becomes incapacitated, the successor trustee she selected will manage her finances and distribute funds for her benefit so she can maintain her standard of living. The trust will also avoid the probate of her assets upon her death. The trustee will distribute our client's assets to her beneficiaries without having to go through the probate process. After a son of a woman with Alzheimer's disease had transferred her real property to himself, pursuant to a power of attorney, we filed claims against her estate and obtained substantial amounts of monies to ensure that her needs were provided for and her other children received the amounts she intended to transfer to them on her passing. On behalf of trust beneficiaries, we have successfully prosecuted numerous claims against trustees. In one such case, the trial judge agreed with us that the trustees had breached their duties to the beneficiaries in a number of ways. They had arbitrarily declared that a beneficiary was incompetent, failed to keep the beneficiaries reasonably informed about the administration of the trust, attempted to sell trust property, and failed to properly manage the property. The judge awarded our clients damages and their attorney fees and costs, which were in excess of $250,000.